Is it a shiver of excitement or fear that is felt when the ebon wagon rolls into Velathae...? 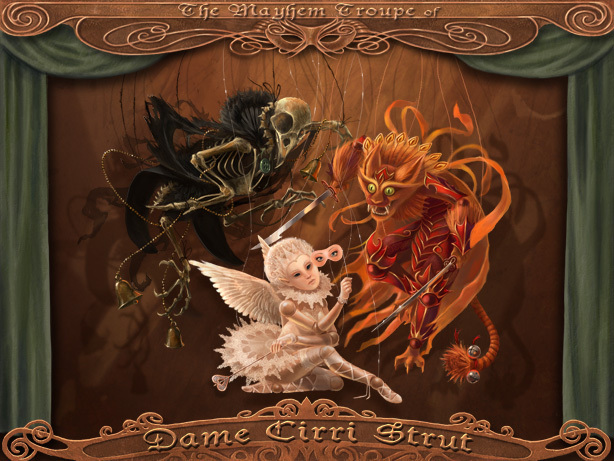 "Dame Cirri Strut's Magical Mayhem Troupe! Splendidly famous, it is world renowned. With magic and wonders that can confound!" Returning at long last to the Human Empire, the Mayhem Troupe leaves behind the Northern Steppes and Shirelands to entertain children and adults alike with their wondrous theatrical acts. The Troupe heralds their arrival with mystical masks that have been appearing in all corners of the globe, each possessed with a strange magic that relays the origins of the troupe. It has been more than two centuries since the legendary family left the village of Velathae , their departure happening days before the ill-fated night that shrouds that small town in mystery, and now they return to their humble beginnings to pay homage to their ancestral home. Stopping for three nights only, the Troupe will arrive the first night of the festival to bring their special brand of talents, mystery, wonder, and fun to those that travel to the village. In a highly anticipated return performance, the Troupe expects to perform several marionette-based plays that are certain to entertain and enthrall! Who is Dame Cirri Strut? Named after the youngest child of the original Mayhem Troupe, Dame Cirri is believed to be an honorary title that has been passed on through the generations from Strut family member to family member. To maintain the mantle of mystery, the Mayhem Troupe never allows its members outside of their wagon without their traditional costume of mask and robe. At its inception, some two hundred years ago in Velathae, the troupe consisted of nine family members that all traveled together in their theatrical wagon throughout the human empire. Rumors say that the Troupe traveled through Talador on their way to Ice Mule and once they were within the cradle of those ancient woods their performance changed forever. More deeply cloaked in mystery, the troupe only ever allowed one of its members to be seen at a time and all under the guise of Dame Cirri Strut. The brilliant stroke of theatrical secrecy has forever changed face of the Mayhem Troupe and draws crowds of legendary proportion. The village of Velathae was not always the subject of low whispers, nor was it shrouded in so much myth and hyperbole. Historical records in neighboring towns located on the outskirts of Riverwood, and even in the City of Helt, tell that Velathae was a village populated by artisans and craftsmen of all types, and its citizens were predominately human, with a minority of ordlyn (non-human race, in this case elves)--not to mention the hathlyn (half-elves) offspring that eventually appeared. The humans of Velathae were on friendly terms with the minority groups, and there were never any officially recorded disputes. The village often attracted attention from some travelers and merchants for the intriguing wares that the villagers produced, which were boasted of as being unusually well-made. Learn the story of Velathae here. The Merchant Consortium of Greater Elanith, in conjunction with the ghostly residents of the village of Velathae , will welcome visitors to this year’s Eve of the Reunion celebration. Visitors to the village may find many wonders, both natural and supernatural, at their fingertips to enjoy. The village of Velathae offers numerous delights and wonders that will surely entertain visitors for hours. Several hosted games by one of the local ghostly residents will happen throughout the entire weekly event. Further, there are recent rumors on the wind of something forbidding happening throughout the village. Be sure to keep an eye out! The games in the orchard are varied and numerous as the apples that grow on the trees. Visitors beware, however, as the spirits of the orchard are a feisty bunch and are unpredictable. Bodily harm may occur. The old Villa Macellarius has been reported to have odd occurrences happening to it since the manifestation of the village. Visitors can explore the villa, but are cautioned to stay alert. The wealthy inhabitants of Winter Wren Estates have not been heard from since the devastation to the village, however the ghostly residents of Velathae have talked about strange sightings within the community. Take a wander past the estates, and knock on a door or two—you may get an answer. Entrance into the great barrow under Tower Hill was expressly prohibited during the living years of the village. However, since the recent manifestation, the seals that blocked off entrance into the great barrow have gone missing. The local ghostly officials have stated that visitors may explore the insides of the barrow, but they will not be held accountable for anything that may happen to those that stray inside. Set aside from the orchard, the old farmer’s field is now host to a spectacular supernatural event—ghost jousting. Ride on an enchanted, ghostly horse against your foe and unseat them to find glory! Be sure to keep an eye on the FESTIVAL command in game as it is updated with live contests, events, raffles, and more for visitors to participate in!